The newest volume of the London Review of Books features a great article all about Finnegans Wake. It is available for free at this link. With the release of a new updated edition of James Joyce's crazily brilliant dream book (which I mentioned back in March), Michael Wood examines the eternal appeal of this strange book while also reviewing the new version which contains over 9,000 corrections (though mostly minor ones). He also makes an entertaining comparison between Joyce and Lewis Carroll, with Joyce coming out on top because while Carroll "has a taste for sheer absurdity, the collapse or travesty of plausible meaning," Joyce does almost the opposite, constructing towers of meaning that are almost unfathomable. "Joyce, as far as I can tell, wants only to multiply meanings, and believes they will never end. We might miss a few, or a lot, and he himself might not always know what they are. But they’ll be there, and some day someone will find them." After reveling in the words of the Wake and the newest edition of it, Wood also takes the opportunity to review another new book all about the Wake. This new book revisits and re-examines the first ever attempt at explaining Joyce's book to the public. 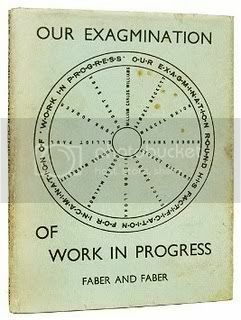 In 1929, a group of writers and intellectuals including Samuel Beckett, Stuart Gilbert and about a dozen others put together a volume of essays defending the brilliance of Finnegans Wake (which at that time was still being published serially under the title Work in Progress in a literary magazine) with the perfectly Wakean title Our Exagmination Round His Factification for Incamination for Work in Progress. A group of 14 different scholars gathered together to critique the original Exagmination with the hindsight of over 70 years of Joyce studies and interpretation. (It must be noted that Joyce still spent another 10 years writing the Wake after that Exagmination had come out and stuck in a few puns mocking the title of the volume.) This volume, put together by Tim Conley, is cleverly entitled Joyce's Disciples Disciplined and it is, sadly, very expensive. Very nice summing up of the article. In fact, I found your description of Our Exagmination more helpful than Woods' was. I Love the image at the top of this story. 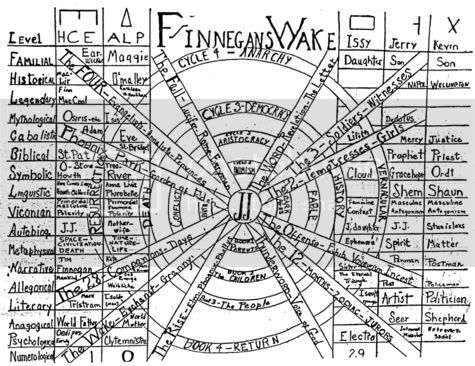 And it appears to me, similar to a map of the central theme of the book I'm currently reading (The Glass Bead Game). Have you any familiarity with Hesse? This is essentially the author's summation of his life's quest in finding aesthetic joy in parallel meanings, and having a game which presents these in a language known to all scholars. Mostly, it's also about the doubt that accompanies dedication to such art, at the expense of "natural life". Beautifully precise, I feel Hesse's characters are not dissimilar to Stephen Daedalus. If you ever read any of his works, I'd enjoy discussing them with you. I've read Hesse's Siddartha and was planning on reading Demian soon but I had no idea about The Glass Bead Game until you mentioned it. That sounds extremely interesting and I will definitely be checking that out. My girlfriend's dad was raving to me about Hesse recently. At the moment, I'm immersed in books on Joyce, Dali and Lacan trying to iron out an essay connecting the three of them. Also seemingly addicted to Ulysses as I am planning on making a series of posts about it soon. But I MUST check out Bead Game now and I appreciate the recommendation.